Today I wandered down the street looking for a nice lunch at a cute little cafe I’d walked by a few times before — Cookbook Cafe. Once I realized it was in the Intercontinental, though, I got a bit worried that it would be too pricey or too stuffy or that I would just feel like a bit of a fool. I couldn’t have been more wrong. Walking through the clean and elegant lobby, bar area and cafe area, with its leather seats, shiny tables and small, square pieces of artwork, I stopped to check out the lobby menus. Not bad, but not a huge selection. I figured if the restaurant wasn’t going to work out, I could settle for a sandwich or some sort of snack out there. There prices were more than what I’d normally spend on lunch — 10 to 20 pounds — but it was a nice, soothing environment where I could at least pull my laptop out and get some work done while sitting in a comfortable spot. When I got to the restaurant, I asked about the menu. It turns out that it’s just as affordable, if not more so than the lobby. And the market table was calling my name. I haven’t encountered too many market tables in restaurants before, but they seem to be the higher-class cousin of the salad bar. No sneeze guard. No regularly shaped and spaced slots. 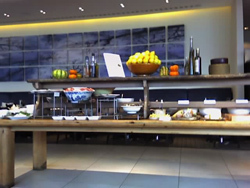 Just an abundance of fresh breads, salads, cheeses and more, laid out on a nice, big, wooden table. For 12 pounds, my meal also included some delicious pumpkin parmesan soup and dessert. The service was also very friendly. My waiter was a very friendly hotel/hospitality management student from China who has been in London for two years now. 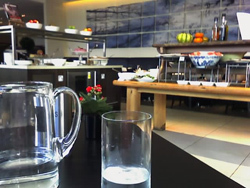 The restaurant wasn’t very full, and it had a quiet, soothing atmosphere, with lots of clean lines and soft music. It would be a great place for a business meeting, and unsurprisingly, the rest of their clientele was in suits. And now that I found the Cafe’s website, I have found out they have a “Chocolate Master Class.” Their description: “You will be starting with a glass of bubbles, Keith will demonstrate some tips and tricks, you will be tasting various chocolates and then you can make your own box of your signature truffles. To finish the sweetness off, our mixologist and bar manager Joel will teach you how to make the most seductive Chocolate Swirl Martini.” OK, I’m sold. Next class is on February 6 if anyone wants to join me.